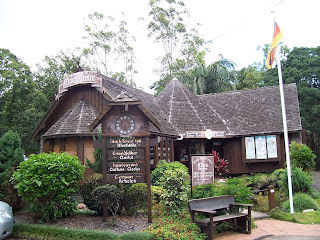 Grandma's Knitting Place: Montville Again!! 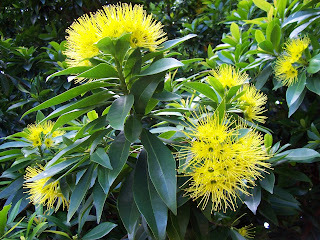 I visited Montville with my friend Edna when she was staying here recently. If you are not too sick of it, here are some more pictures of this fascinating little place! 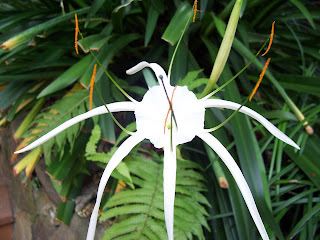 This lovely spidery looking white flower is a native lily. 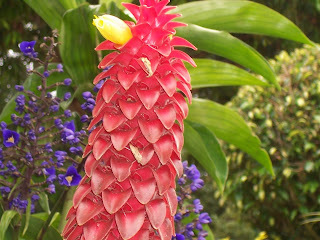 This mysterious looking plant we think is a type of flowering ginger - the red part is bracts, the actual flower is the yellow protuberance - if you look carefully you can see a couple of dead yellow blossoms further down. 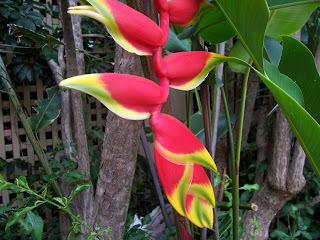 This wonderfully exotic yellow and red flower is a heliconia, a relation of both the banana plant and the Bird of Paradise, or strelitzia. 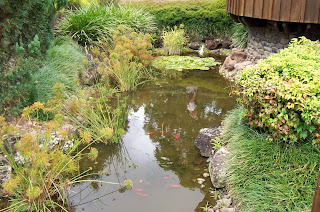 On the right is the Clock House - you enter it by a little bridge over a lily pond full of red carp. Inside it is like fairyland, walls of clocks, freestanding clocks, cuckoo clocks, grandfather clocks, antiques, futuristic, even a grandfather clock with a glass front showing every cog and wheel of its interior workings! I filmed one whole wall of little cuckoo clocks, all the pendulums moving - fascinating! Some of the cuckoo clocks are hand carved masterpieces from Germany, Holland and Switzerland. And they have the cutest little Weather Houses from Germany and Music Boxes to die for , highly polished and inlaid, and with the most beautiful painted designs on them. 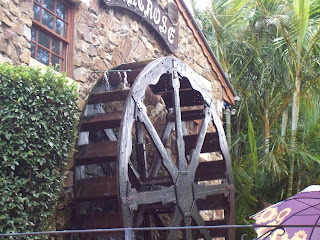 On the same side of the road as the Clock House there is a restaurant, The Montville Rose, which has a Water Mill on its outside wall - fascinating tourist attraction. And then you have a wonderful Candy Shop across the road, which sells Crystallised hard candy - what we would have called rock or boiled sweets! 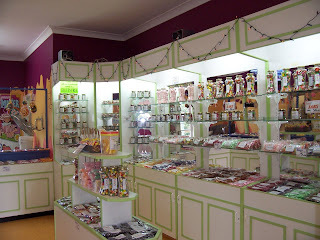 The shop is divine - the candy is expensive but so pretty to look at - they have candy with lettering all the way through - saying, "Thank You", "I Love You" and even "Bugger!" The shop is pretty too, clean as a whistle, and very attractively set out! 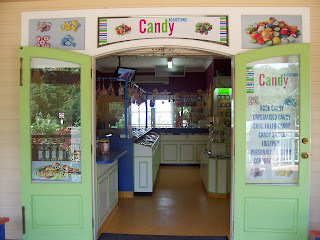 And as a bonus for tourists, they have daily demonstrations of how they make the candy - including pulling taffy! such a beautifully old fashioned looking little shop! 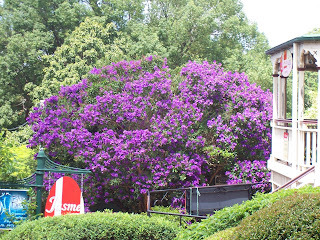 And everywhere you look is colour - this is a tibouchina, one of the many flowering trees and shrubs that line the village street. There are even old fashioned roses and David Austin Roses growing outside the various shops and sidewalk cafes. 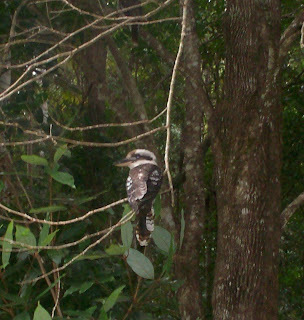 And this little travelogue wouldn't be complete without a bird picture - here is a very interested Kookaburra watching us - he stole a sausage right off our barbecue in the picnic park a few minutes after this picture was taken! As I said on your last post, definitely on my list of places to visit!